Gradually you change your face or your photo into a very fun virtual card by erasing the screen. It is truly magical and surprising. 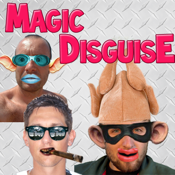 You can test many disguises to make pictures and very funny e-cards to send to your friends. Simply download a picture of yourself or someone you know and you choose the type of change you want and you will see your face changing. You can keep this photo on your iPhone and share it with your friends on facebook or email.